If I get obsessed with something and there's a beauty part to it, you can bet that the massive beauty junkie in me will spend hours googling it. 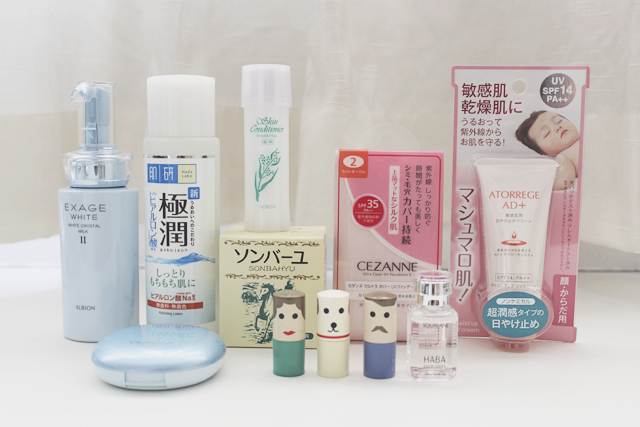 Hence, it's completely natural that I started hauling Japanese beauty products again. Am so glad that the Great Singapore Sale is here now and has even been made available online. Away from the heat, away from the crowds... That's what I like. And also, GSS means that in the virtual world, there are these awesome coupons and deals for almost everything under the sun. Cannot. Wait. For. Pay. To. Come. In. And... I digressed. Heh. Anyway, Japanese beauty products always pride themselves on using the very best of everything - quality, technology, knowledge etc. So I feel very safe using them. (: But of course, I still monitor my skin when I try a new product. I tried the 3-Step Skincare System and the White Lady last year, and I really enjoyed the regimen. It was simple, fuss-free and most importantly, free from parabens, fragrances, mineral oils, artificial colourants and petrochemical surfactants. If I ever retire from being a beauty junkie, this is the regimen that's going to follow me for the rest of my life. This has been a great friend since 2011 and I like the Super Hyaluronic Acid Hydrating Lotion best. It keeps my skin so well-hydrated and clear that I always keep a bottle in my bathroom. Whenever my face feels oily in the day, I splash some water, dry it and pat some of this in. This brand was raved quite a bit previously in the local beauty blogosphere, so I started googling for reviews and if you check the brand's hashtag on Instagram (HAHA. I really love my beauty products. ), there are many Japanese ladies who love this as well. Especially the Skin Conditioner. I got a trial set at the Takashimaya counter last December and when there was a sale online, I ordered 3 big bottles of the Skin Conditioner. HAHA. Do I like it that much? Hmmm... It's difficult to say. It's lightweight, makes my skin soft and hydrated, but I'm still not really sure if it's worth the price. Will definitely only buy it when there's a sale. This brand is everywhere. I love their Tsubaki hair care products (Loyal fan since JC days.) and those tiny lip balms, which I got from Taiwan, are the most adorable things ever. I don't know why I haven't tried their skin care products (Actually, I do. I have a whole drawer of untouched products! Heh.). But, soon! Haha. I always see Horse Oil when there's the Japanese fair at Isetan Scotts, and I decided to pick a little tub when I saw it at Tokyu Hands. I was hoping that it would help with my eczema, but umm... It works better just as a moisturizer. Heh. Maybe this will work better in the long run? It's supposed to reduce the risk of scarring.